The numbers of Creams increased over the years, and the American Cream Horse Association of America was granted a charter by the State of Iowa in 1944. 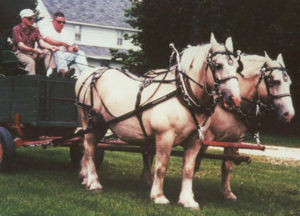 The breed was recognized in 1950 as standard by the Iowa Department of Agriculture, giving the American Cream draft horse the same status as any of the other draft breeds. The age of mechanization led to the replacement of most draft animals with farm tractors, and all the draft breeds saw their numbers decline sharply. The American Cream, with a smaller number of animals, nearly became extinct. Ead’s Captain, reg. no. 209, and the gentleman in the photo is Arnold Hockett, of Estherville, Iowa. 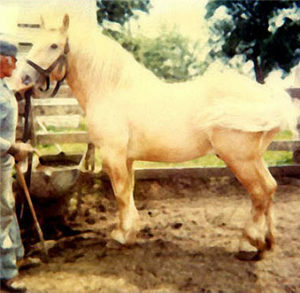 Ead’s Captain is the ancestor of about 1/3 of the American Cream draft horses today. Then, in 1982, several breeders met and re-opened the books of the organization, which had become inactive. Today the numbers are increasing, but are still dangerously low, with fewer than 400 animals currently registered. The breed standard is a draft animal that possesses the cream coat, pink skin, and amber colored eyes. Mature animals will stand 15-16.3 hands, with mares weighing 1600-1800 lbs and stallions from 1800 to 2000 lbs. It should be noted that the association members pledge to maintain the breed as is has existed for the past century, rather than yield to the temptation to breed a more “modern” or “hitchy” type of animal. Also, the American Cream Draft Horse Association has been pro-active in testing its registered animals since JEB was discovered and test procedures were developed. The American Cream draft horse is also known for its calm, willing demeanor, which makes it a good choice for those just starting in draft horses.